As part of a series examining best practices in water resilience at the home and community level, this post looks into simple and practical household- and community-scale water filtration and storage systems. 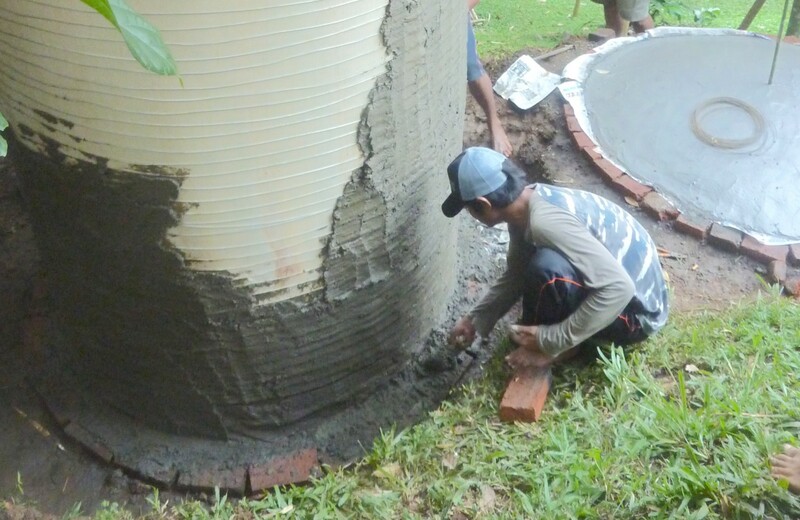 Creating a cover for a ferrocement water storage tank at the Bali Appropriate Technology Institute in Tabanan, Indonesia. Photo by Carly Gayle. Community water resilience encompasses purification systems for drinking water; household water collection and storage; and stewardship of shared water resources such as aquifers and rivers. Together, the stories in this piece point the way towards a vision of water management that is resilient, replicable, and human-scale — one that combines new ideas with age-old place-based solutions. Whether captured and stored from rainwater, drawn from a well, or supplied by the government, reliable potable water is a necessary component of any resilient water system. Aqueous Solutions, a nonprofit based in Thailand and the USA, promotes the research and construction of three-stage filters using gravel, sand, and activated charcoal. 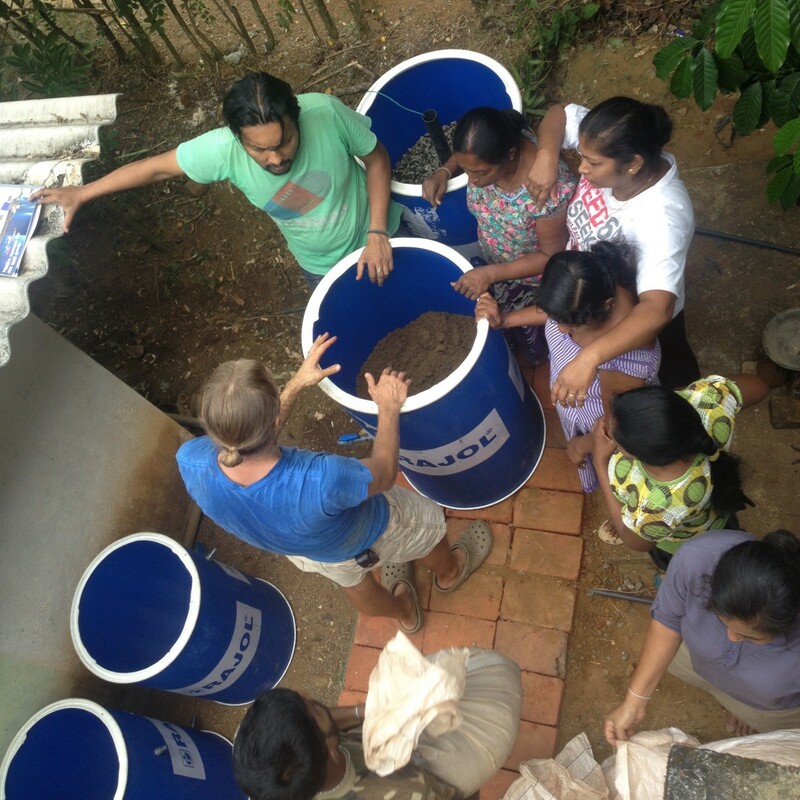 In March 2016, the organization installed a filtration system for a women’s rural development center in Weligepola, Sri Lanka. Making use of sand and gravel from a nearby river along with charcoal made from fast-growing gliricidia trees on a black pepper farm, a dozen people built the system in just a couple of days with roughly US$100 of purchased materials. Adding locally-collected sand and gravel to a water filtration system (left) and plumbing the system (right) in Weligepola, Sri Lanka. Photos by Carly Gayle. One of the women remarked that families in the area once used a similar system with gravel and sand for filtering water, which fell out of use after the government began to supply water through pipes. 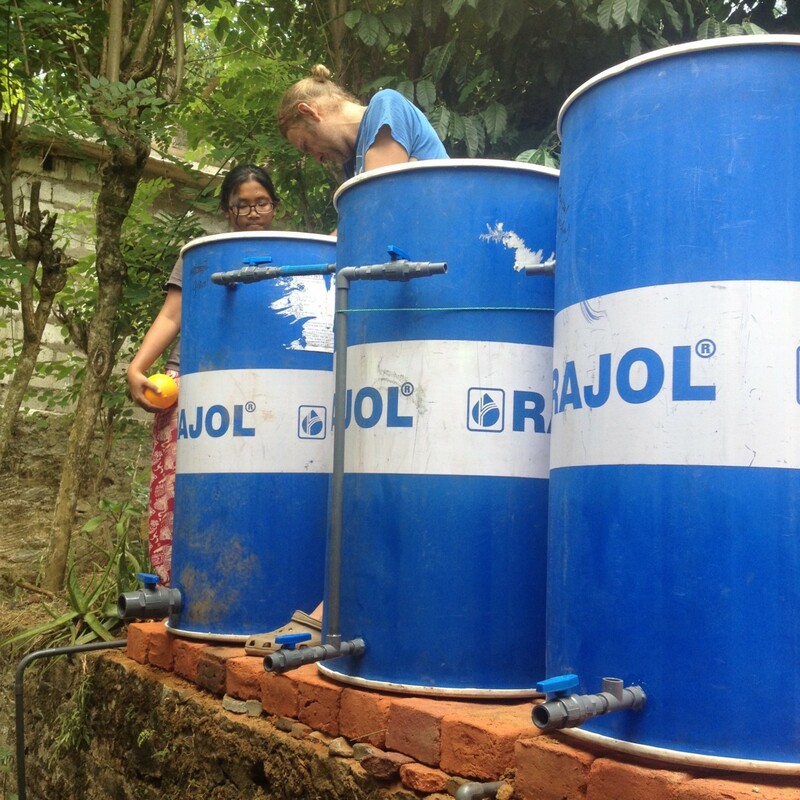 For her, the filter’s construction validated the merit of the community’s traditional potable water solution. Throughout Southeast Asia, the three-filter system is now spreading from village to village through word of mouth and peer-to-peer teaching. In other parts of the world, locally manufactured clay pots are being turned into water filters. Fired with colloidal silver and sawdust or rice husks — which create small pockets of activated carbon — this human-scale technology is becoming increasingly common. Ecofiltro in Guatemala and Pure Home Water in Ghana both operate in rural areas and sell pots at affordable rates. Tri Hita Karana Bali in Indonesia promotes a wholly handmade water filtration system constructed of locally made terracotta pots and activated charcoal. Approaches are as diverse as the needs and the cultures of the people who employ them. 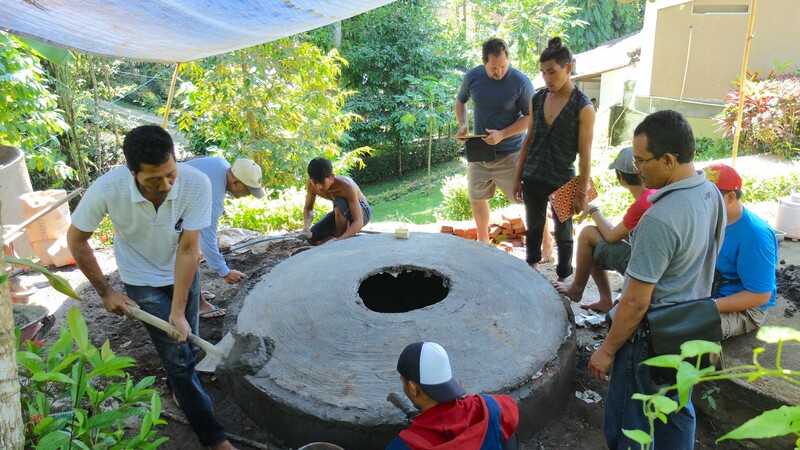 Rus Alit demonstrates construction of a sandstone water filter, a modern adaptation of a traditional Balinese technique, at the Bali Appropriate Technology Institute in Tabanan, Indonesia. Photo by Carly Gayle. At the Bali Appropriate Technology Institute (BATI) in the lush mountains of Tabanan in Indonesia, water wheels, ram pumps, and canals circulate water throughout the property without using electricity. Rus Alit, the founder of BATI, has brought water to communities throughout Indonesia and all over the world, and teaches biannual workshops at the Institute. In September 2016, Rus Alit ran a 5-day course for farmers from Lombok, where most residents relied on water from trucks. He taught them how to construct above- and below-ground ferrocement water tanks, handmade pumps that don’t require electricity, and several types of filters. The tanks can be used with rainwater harvested from roofs or from other sources on the land itself. The 2,500-gallon tanks are relatively light, made with materials and tools found at any local hardware store, and can be built in a few days for less than US$150. Plastic tanks of the same size cost upwards of US$1,000, require more frequent cleaning, and are rarely available in the region. For some of the farmers, a BATI-designed tank pays for itself after filling with rainwater just a few times. Farmers from Sekaroh, Lombok add the finishing touches to a cistern at a ferrocement tank construction workshop. Photo by @jendelarumahkita. Local water collection and storage allows farmers to keep kitchen gardens throughout the dry season, which lessens the strain of seasonal spikes in commodity food prices while providing a buffer against the increasingly irregular rainfall in the region — a consequence of climate change. The participants in BATI’s course also quickly grasped how a localized water supply can support land-based livelihoods: some planned to create new market gardens and orchards, others saw opportunities to create businesses building ferrocement tanks, and one made plans to run his homestay using 100% rainwater. A workshop participant plasters an aboveground ferrocement tank at BATI, as the tank cover dries in the background. The plywood molds can be reused and shared among communities. Photo by Carly Gayle. The most resilient water systems go beyond providing for immediate household needs: they involve caring for the entire local ecosystem on which people depend. In the early 1980s, the community of Alwar in semi-arid Rajasthan, India, was in crisis. 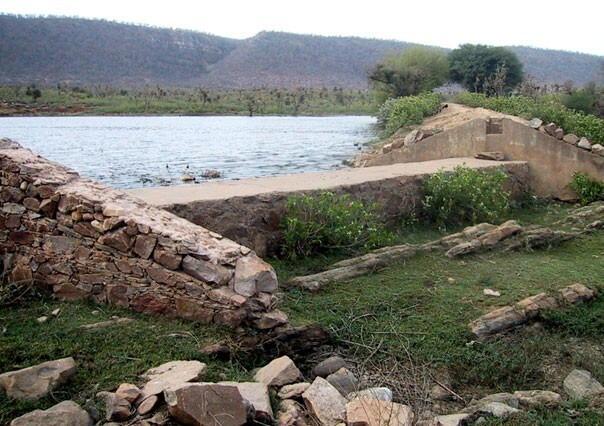 As far back as 1500 BC, local residents had shared johads, crescent-shaped dams that captured rainfall runoff. These johads created communal ponds for livestock, from which water slowly seeped into aquifers to feed wells throughout the year. 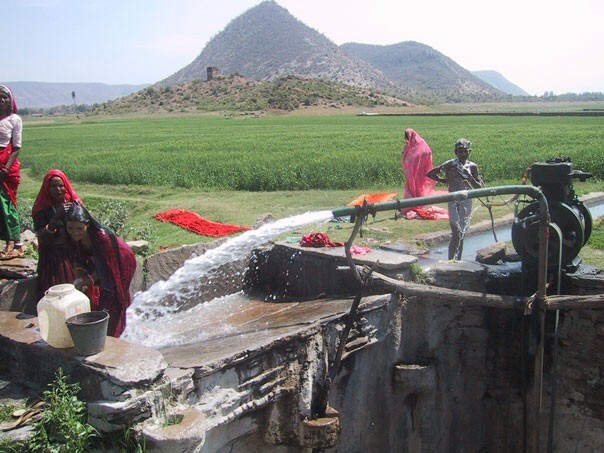 For millennia, traditional johads (left) in Rajasthan provided water for livestock throughout the dry season and replenished aquifers. 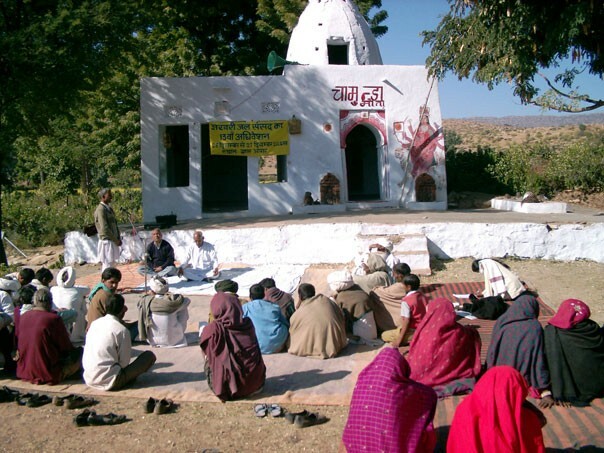 Johads were constructed and maintained by village councils known as gram sabha; like the modern-day Avari River Parliament (right), councils came together to manage regional water resources. Photos by ecotippingpoints.org. Under British colonial rule, forests were logged, traditional village governance systems were dismantled, and common lands were divided. In the 1950s, the government brought deep wells with diesel-powered pumps to the region; the water table dropped, necessitating ever-deeper wells. Trees died from lack of water, erosion increased, rivers dried up, and men abandoned farming and left for cities in search of work. In 1985, Rajendra Singh and three others from the University of Rajasthan worked with the community of Alwar to dig out an old johad. 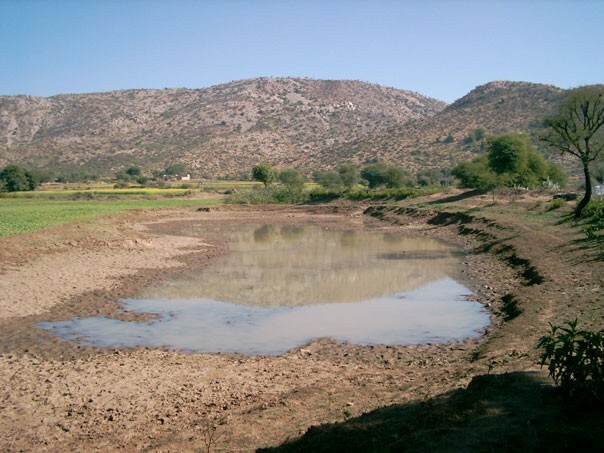 In the following monsoon season, the pond filled with water, and long-dry wells had water once more. Over the next ten years, village residents worked together to build a large irrigation dam and restore nine more johads, raising the water table by 23 feet. They restored the traditional community council, the gram sabha, to care for this shared resource, and reforested the area around the village to protect the water supply. Village residents draw water from a well and irrigate wheat fields; beyond the fields, the landscape is dry (left). Larger irrigation dams, also built communally, supplement the johads in some villages (right). Photos by ecotippingpoints.org. In Bali, structures like johads and dead-level contours are not feasible due to the dense population and small parcels of land. There, IDEP Foundation is addressing the rapidly falling water tables with recharge wells — abandoned or new deep wells that are used to return water to an aquifer rather than drawing from it. Wells are located downhill from floodplains, roadsides, and other areas where water naturally pools; channels are dug to connect them, with gravel filters to prevent debris and excess silt from entering the aquifers. In urban areas, water is piped in directly from rooftops. Similar systems can be implemented anywhere in the world. In each of these cases, local water resilience depends on remembering and honoring place-based relationships between people, water, and the land. It involves reclaiming water purification, storage, and management solutions that have been in use for millennia, and updating them to account for higher quality standards, locally-available materials, and the problem of modern contaminants. In this way, local water sovereignty is a shining example of how combining global knowledge exchange with local adaptation and initiative can provide for vibrant, flourishing livelihoods on the land. Clean water flows from a handmade slow sand filter at BATI. Photo by @jendelarumahkita. Explore more grassroots initiatives for localization and community resilience in the Planet Local library on Local Futures’ website, www.localfutures.org. 1. Rus Alit, in a presentation held at the Bali Appropriate Technology Institute in Tabanan, Indonesia, Sept 19, 2016. 3. Suutari, Amanda, and Gerry Marten, “Water Warriors: Rainwater Harvesting to Replenish Underground Water (Rajasthan, India)”, EcoTippingPoints.org, June 2005. 5. “Bali Water Protection Program”, IDEP Foundation, 2015. http://www.idepfoundation.org/en/bwp See Annex 2 for diagrams and case studies of gravity-fed recharge wells. An encyclopedia of traditional water collection and storage systems throughout India at rainwaterharvesting.org. The Mandacaru Awards, a collection of outstanding water management and filtration innovations in Brazil. Oasis Design publications, which cover a broad range of options for water collection, storage, filtration, and management; metrics for choosing appropriate designs and materials; and detailed building instructions. Follow Local Futures on Facebook and Twitter, or by email. Visit www.localfutures.org to learn more about our other projects.